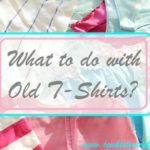 Do you have a stack of old t-shirts? 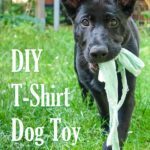 Then turn them into something useful and make these 5 different T-shirt dog toys that your pup will love! I had so many leftover T-shirt pieces from my refashioned T-shirts: sleeves and cut-off knit fabric pieces. 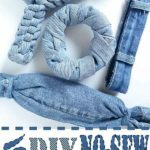 For most of the following DIY T-shirt dog toys I used 6 sleeves and 3 fabric strips that were leftover from my refashioned T-shirt skirt. For the donut shaped dog toy, I used a cut-off sleeve leftover from my 1920s-style refashioned middy blouse. 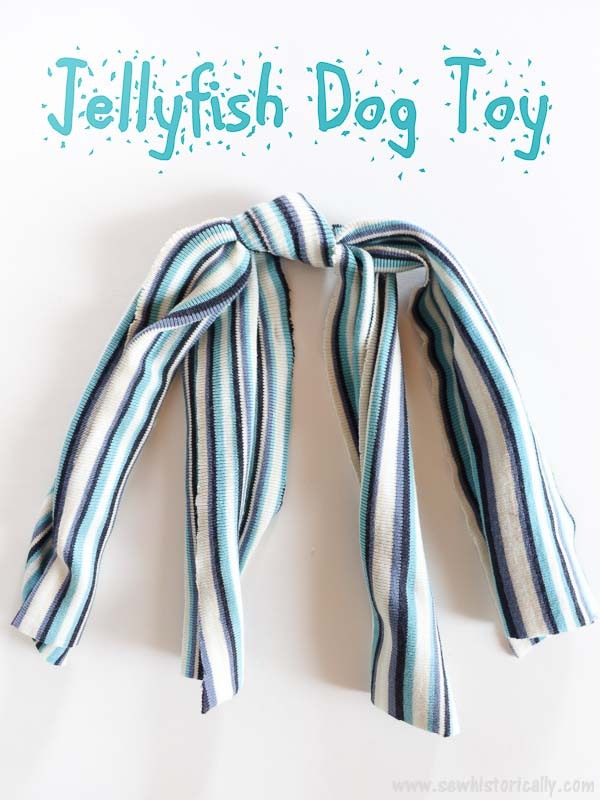 And I made the jellyfish dog toy with leftover fabric from my dress to top refashion. 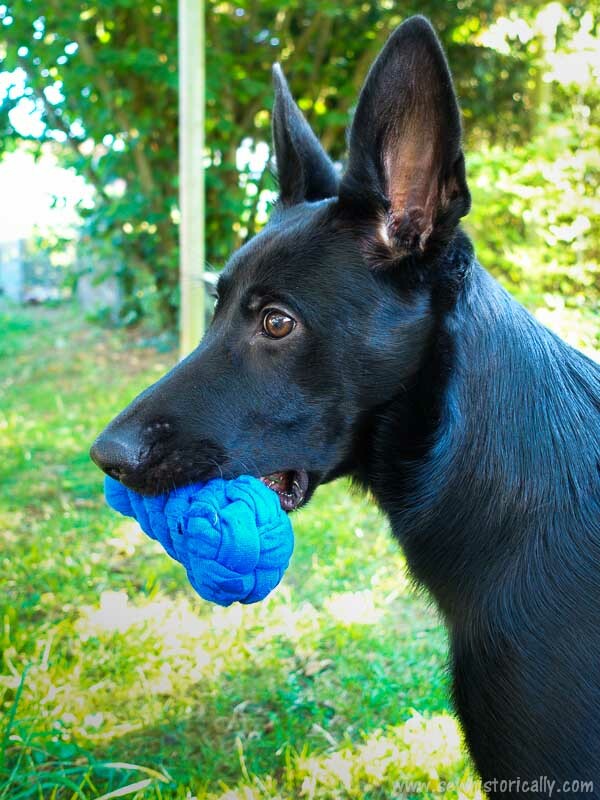 Since May 1 there’s a little black GSD puppy in my life (more pictures of her on her instagram account) Because she’s a puppy and teething at the moment, she chews on everything at the moment. 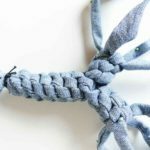 So I made her these DIY chew and fetch dog toys: She loves to chew on the big knots and braids of the T-shirt dog toys, carry the toys around and play fetch with them. Safety note: The toys aren’t indestructible so throw the toys away when they’re torn. 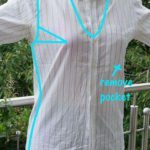 Cut off the seams and hems of the T-shirt. Cut the T-shirt into roughly 12 in. (30cm) strips. Then roll the T-shirt strips into sausages. 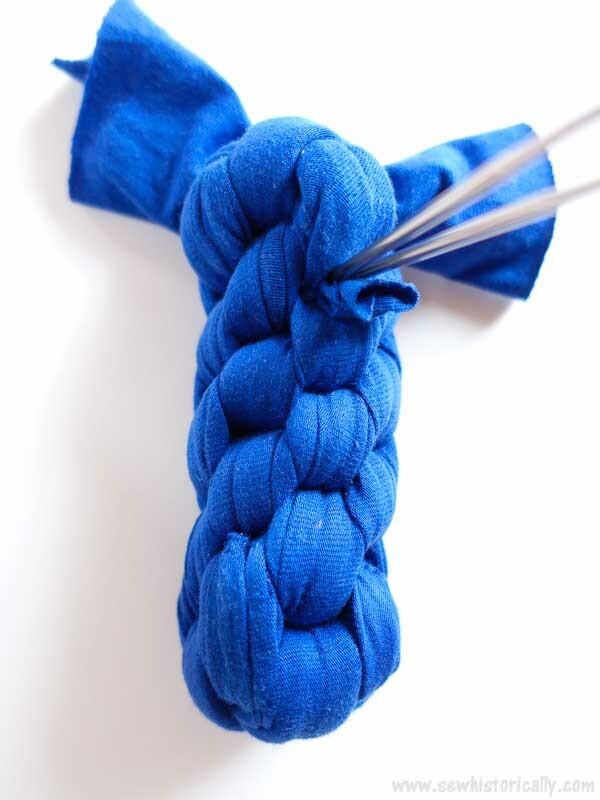 Tie together three T-shirt strips with an overhand knot. 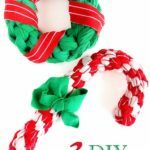 Tightly braid the three strips together and secure the end of the dog toy with an overhand knot again. 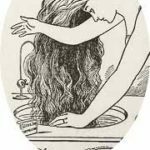 Trim the ends if necessary. Cut the T-shirt into roughly 10 in. (25cm) strips and roll the strips into sausages. 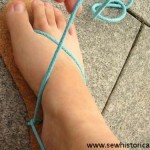 Then start tying crown or square knots (see picture above). 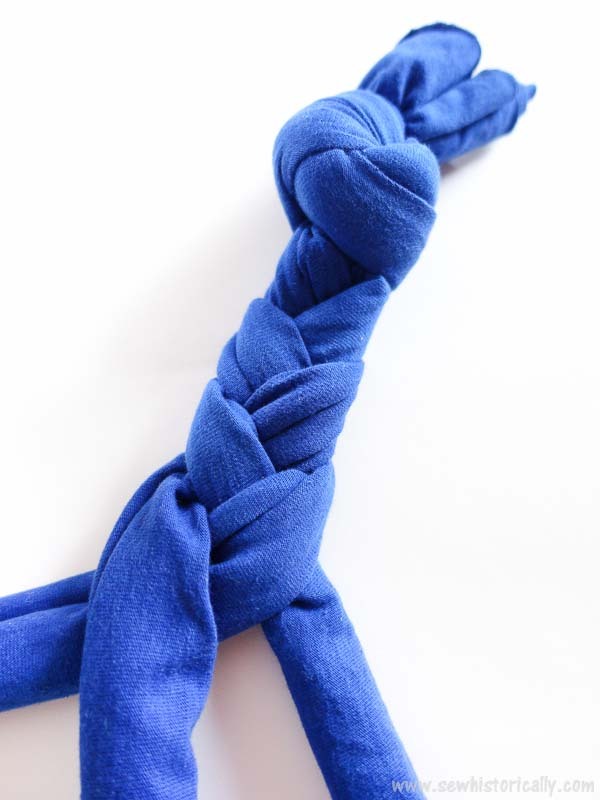 Here‘s a video of how to tie crown knots. 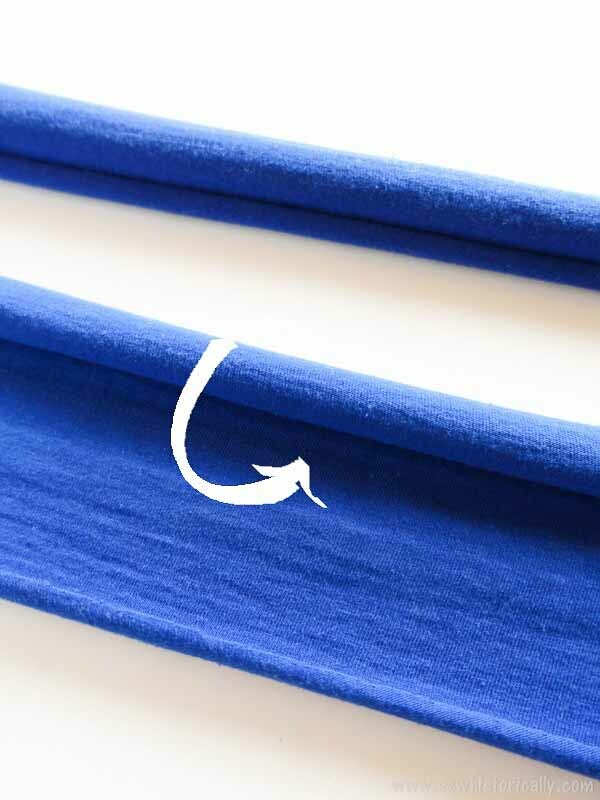 Push the T-shirt ends back into the dog toy with a knitting needle. Cut the T-shirt into roughly 10 in. (25cm) strips and roll the strips into sausages. 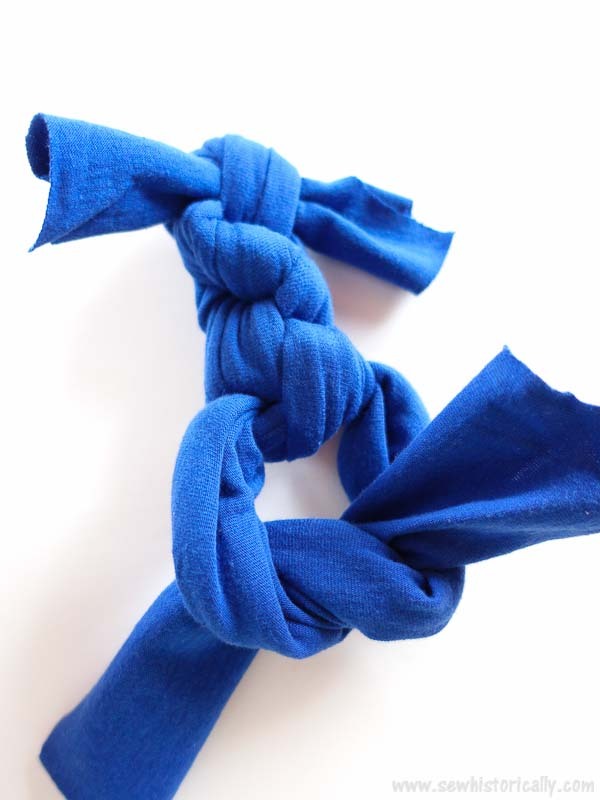 Tie together two T-shirt strips with a series of square knots. 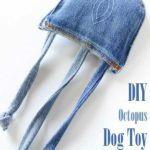 Optional: To prevent fraying you can hide the T-shirt ends inside the dog toy: Push the ends back into the dog toy with a knitting needle. 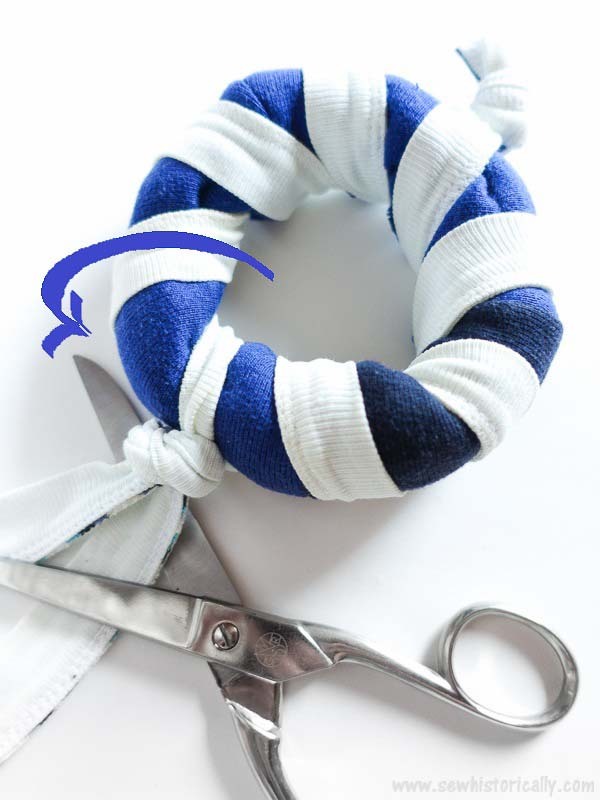 For the nautical donut dog toy or life ring dog toy, you’ll need a cut-off sleeve, leggings leg or socks with the toes cut off. 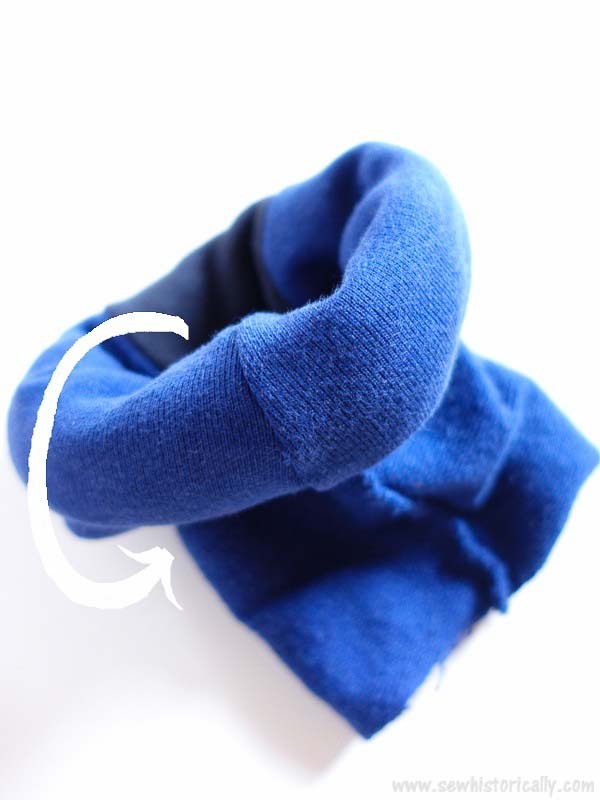 Roll the sock up into a donut shape like you would for a sock bun donut. 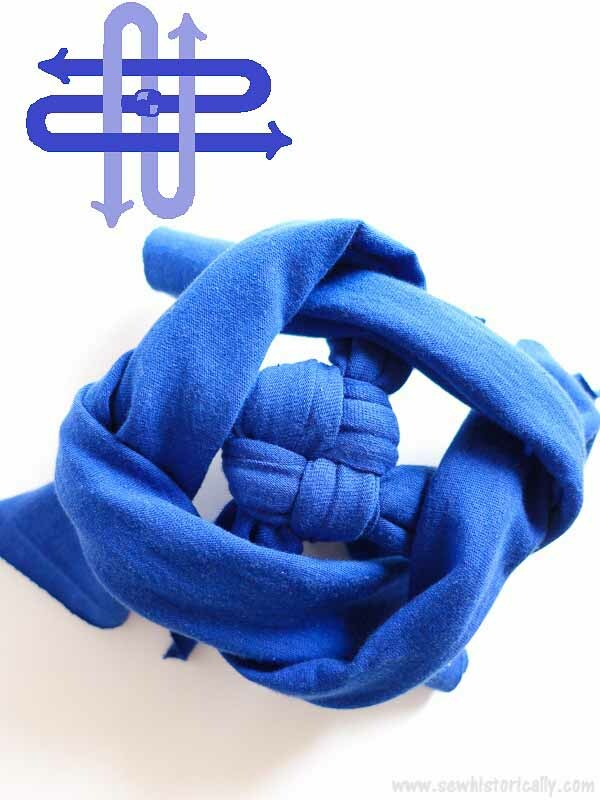 To secure the donut shape, wrap a long strip of knit fabric around the donut and tie the ends together with an overhand knot. Lina I too have a teething puppy and he wants to bite everything. He usually ends up grabbing the plastic water bottles but I like these toys much more. I will be making them pronto! Thanks, Mary! 🙂 I’m glad you like them! OMG! I have a 5 month old Bernese Mountain Dog. 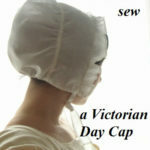 I so have to make some of these. I would luv for you to also share this with us at Wall to Wall DIY Wednesday! I love this SO much!!! My dog is going to be so happy! I don’t have a dog but my Uncle does and some of my friends do. I thought this was a really creative way to get more use out of old shirts. 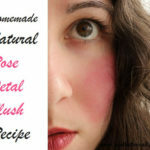 Love all 5 ways! Thanks for stopping by, Maureen! Homemade toys for our furbabies are the best! 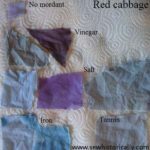 And all of these are wonderful ways to upcycle t-shirts into something special for them! 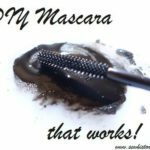 Thank you so much for sharing this with us at the Homestead Blog Hop! It has been selected as one of our features this week, congratulations!! 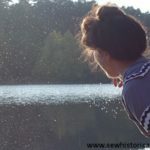 Thanks for featuring me, Ann! What a fabulous idea!! We are thinking about getting another puppy and these will be just perfect instead of our furniture and shoes! 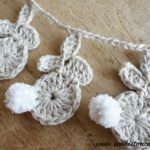 Thank you so much for sharing your fun project with us over on Waste Not Wednesday! These are great, large dogs go through so many chew toys and they can be very expensive. You could even make one out of your own clothes to help keep pup comfy when your away. Love it. I love these toys. 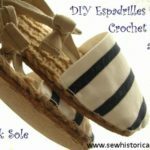 I am going to make some for my dog. Thank you for sharing at Dishing it and Digging it link party. 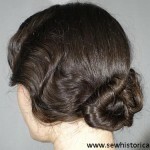 You are one of the features for this coming Sunday party. Thank you again. Thanks for featuring me, Vanessa! 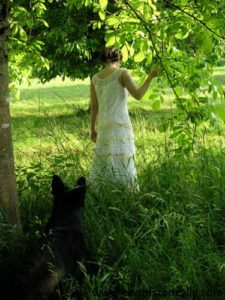 Great ideas for dog lovers and their dogs. 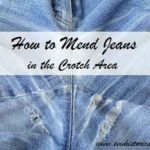 Lina I’m writing a post on repurposing clothes and I’m going to add a link to this post, if that’s alright with you.